Staples' Hannah DeBalsi runs in the 5,000 meter race at New Balance Indoor Nationals at The Armory in New York City. WESTPORT—It started in 2008 with Henry Wynne, it may end in 2016 with Hannah DeBalsi and Eric van der Els. 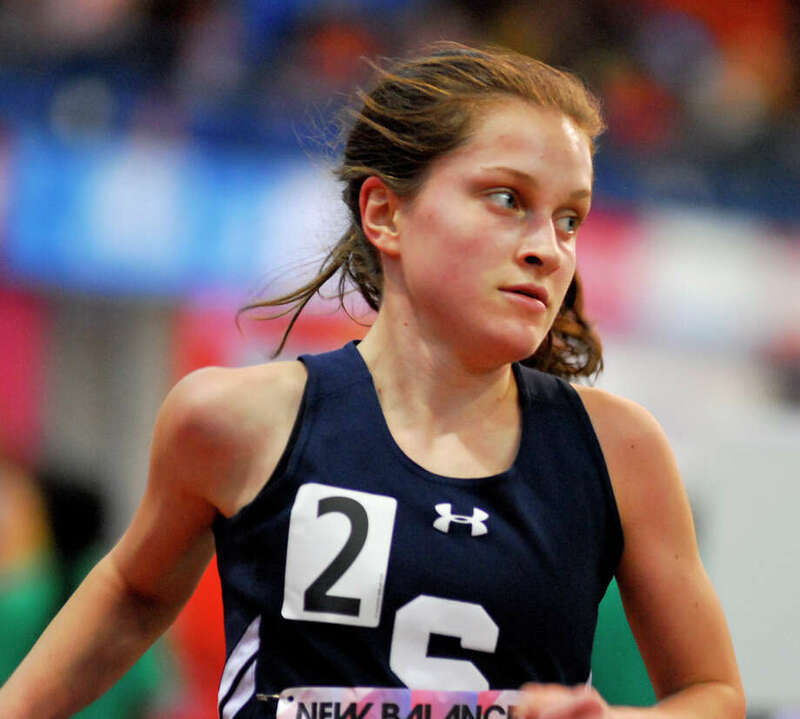 Fairfield County’s contribution to national distance running has been immense in that period, with Fairfield Prep’s Christian Alvarado (Georgetown), Westhill’s Claire Howlett (Stanford) and Darien’s Alex Ostberg (Stanford) in between setting the standard. DeBalsi (Staples) and van der Els (Brien McMahon) — Hearst Media’s 2016 Indoor Track MVPs — have carried the flag in their senior seasons. They both closed the indoor track seasons with phenomenal efforts in the 5,000 meter run at nationals. van der Els took first place while DeBalsi finished fourth. Both are once in a lifetime runners at their respective schools, completely re-writing the record books in the process. DeBalsi stormed onto the scene as a freshman, and van der Els broke out as a junior. van der Els ran a perfect race in taking top spot at the national meet, remaining in touching distance of the leaders for the entire distance before turning on the jets in the final laps. DeBalsi became the first athlete — male or female — to win the same event at New Englands in four straight seasons when she took top spot in the 2-mile at the Reggie Lewis Athletic Center in Boston. Reserving energy for the national race, DeBalsi was finally able to test herself against the top runners in the country. At The Armory in New York City, DeBalsi crossed the finish line and fell over in a heap after placing fourth. Representing the Senators at every meet, van der Els was delighted to be able to bring a national championship back to the school. McMahon placed second at FCIACs, Class LL and the State Open behind van der Els, who ran the 1,000, 1,600 and 3,200 each time. Both have one more season outdoors before DeBalsi heads west to Stanford and van der Els makes the short journey to Stoors.